Jenkins’ unique METLKOR construction is the sturdiest and best construction money can buy for cylinder brushes. These cylinder brushes give you the strength of epoxy-set brushes, the brushing ability of tufted brushes and the strength and deflection and rotation speed of metal cores. Cylinder brushes are made by taking two flat wires of which one is formed and the other is pinched and laid flat forming a cavity. Simultaneously, adhesive is applied and filaments are set in the cavity while the assembly is wrapped around a core. The advantage to this construction is that when the filaments wear out the cores are sent back and Jenkins strips off the wires, inspects the core and the shaft, and repairs as necessary. The cores are refilled as in the original manufacturing process, and the brush is returned to the user — a truly refillable brush that offers “like new” performance with a significant cost savings. Cylinder brushes are available in many patterns and densities depending on how the wire is punched and the tufts arranged. Industrial brushes can be trimmed flat or can be trimmed with a contour, crown, stepped, concave or convex. Cores are available in aluminum, galvanized steel and stainless steel. Cylinder brushes can be filled with synthetic or natural filaments. Industrial brushes can be trimmed flat or can be trimmed with a contour. Brushes can be trimmed with a crown, stepped or concave and convex. 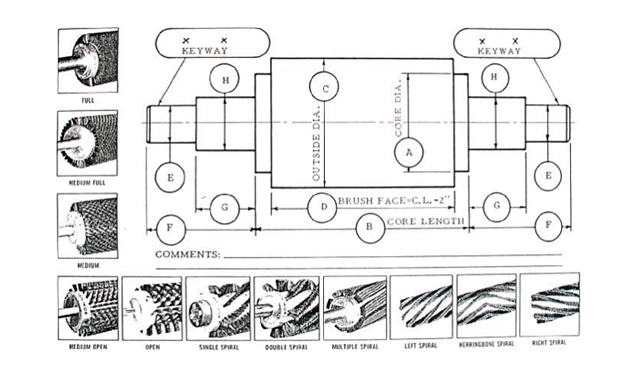 Designing a cylinder brush can be as simple as replacing and improving on an existing brush, or it can require the consideration of a large number of variables that need to be investigated before the best brush for a job is recommended. Jenkins Brush Company, being a full service brush company supplies industrial brushes in all of the major brush constructions including the unique tufted METLKOR construction, wound, staple-set, channel strip, epoxy-set, wire drawn, and twisted-in-wire constructions.